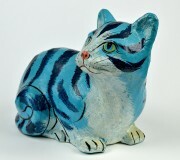 An exhibition of British Studio Pottery from the Ken Stradling Collection curated by David Whiting. We are delighted that David Whiting will be at the launch on 30 March and happy to discuss aspects of the exhibition with visitors. Expressive Clay explores the free and expressive use of clay in British studio ceramics that emanated from the London art schools in the 1950s and 60s. Focussed on art colleges like the Central School, Camberwell College of Arts and Crafts and the Institute of Education, this work moved away from functional wares to a more sculptural approach to the material that was characterised by free throwing and radical hand-building methods. We are holding an “in conversation” with David Whiting, Chris Yeo (KSC Curator) and Dr Oliver Kent (ceramicist and KSC Trustee) on Tuesday 16 April at 6.30pm at the Stradling Gallery. The Stradling Gallery is open Wednesdays and Saturdays from 11am – 4pm during the exhibition. Curious about what’s upstairs at the KSC? You will hear how Marcel Breuer came to design furniture for Bristol furniture manufacturer Crofton Gane in the 1930s, and fascinating stories behind many of the glass, ceramic and sculptural objects on view upstairs, as well as the history of the building itself. Please be aware that there are two flights of stairs to reach the top floor, with hand rails on each side. We can’t accept payment by card. The Stradling Gallery is delighted to present an exhibition of contrasts. 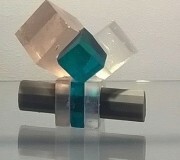 The Glassworks exhibition features glass artefacts created via 3D printing alongside classic mid-century to present day glass objects from the Ken Stradling Collection. The glass artefacts are the results of a research workshop led by UWE Senior Research Fellow, Tavs Jorgensen in collaboration with glass artist Angela Thwaites. Participants from a wide range disciplines were involved to explore the use of glass investment casting with 3D printed mould patterns in their particular field, including: engineering, fashion, fine art, physics, craft, textiles, architecture, jewelry, graphics and digital media. The exhibition is a great opportunity to see how new digital processes in combination with traditional skills can deliver the seeds for innovation for new applications with the glass medium. Alongside this display of this cutting edge research will be classic British and European studio glass from the Ken Stradling Collection. Ken has been collecting glass since the 1950s, and is delighted to be able to show these exciting new forms in the Stradling Gallery. GlassWorks exhibition has been extended and will be open to view every Wednesday between 11.00 and 4.00 at the Stradling Gallery until 20 February 2019. In collaboration with UWE we are delighted to present two talks as part of a symposium on glass making. 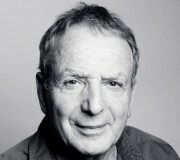 11.00 – 12.30 Peter Layton, one of the world’s most respected glass artists, will talk about the early days of the studio glass movement in the 1960s in the USA and its development and blossoming in this country until the present day. An hour break for lunch – there are many cafes in the area. 1.30 – 3.00 Tavs Jorgensen, Senior Research Fellow at UWE will talk about his fascinating research project exploring cutting edge 3D printing processes in moulded glass with designs relating to fashion, art, engineering, architecture to digital media. Objects created in the summer research workshop will be on view alongside glass by Peter Layton and glass from Ken’s collection. We are delighted to present a very special exhibition of studio glass by Peter Layton of London Glassblowing alongside studio glass from the Ken Stradling Collection. 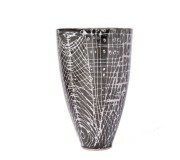 Ken Stradling and Peter Layton were pioneers in their chosen areas of work – Peter with the newly developing hot glass studio world of the 1970s, and Ken as a patron and collector of contemporary craft and design since the 1950s. For both men, a clarity of vision has been central to their success. 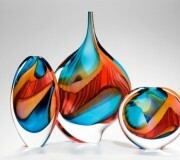 Peter’s work will be for sale, a great opportunity to buy fabulous art glass and support the KSC. The exhibition continues until 10 November. 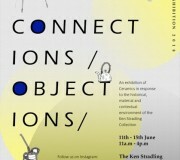 An exhibition of ceramics made by second year students from Cardiff School of Art and Design will be on show at the gallery at the Ken Stradling Collection. The Private View is on Monday 11 June from 5.00 – 7.00. Join us to see exciting and fresh new work inspired by the Ken Stradling Collection. The show then continues each day of that week until Friday 15 June from 11.00 – 4.00 with a warm welcome and free admission. This is a great opportunity for us to show the results of some of the inspiring collaborative educational work that we have been engaged in. 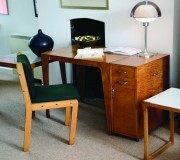 This year marks the 70th anniversary of Ken Stradling’s association with design. To celebrate this landmark we are presenting an exhibition of 70 objects that showcases the diversity of this unique collection. The launch of 70 Objects takes place on Saturday 17 February from 11.00-4.00. To coincide with the launch we are offering a guided tour of the upper floors from 11.00 – 12.00. This event is now fully booked. After the tour, the upper floors will be open for everyone to view as a special launch event. During the exhibition the ground floor gallery will be open every Wednesday and Saturday from 11.000 – 4.00. As part of our ‘A Life in Clay’ exhibition we are delighted to present a tribute to the potter Marianne de Trey, who passed away last October at the age of 102. 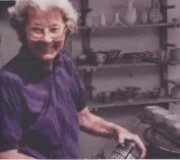 Marianne and Ken became good friends in the 1950s when the Bristol Guild first started stocking Marianne’s pots. 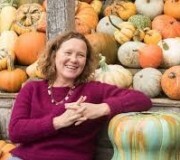 Working from the Shinners Bridge pottery at Dartington from 1947, her pots reflect her liberal and egalitarian values, as she believed in the importance that crafts can play in the enrichment of everyday life. Join us for this very special Friends of the Ken Stradling Collection event with renowned ceramicist Kate Malone. she has made there over the last 30 years. Friends of the KSC have priority booking until 30 October. Tickets for this event are £15 to include a glass of wine or soft drink. Ken Stradling has collected studio pottery all his life, his very first purchase being an Elton ware vase when he was 16 in 1938 for £1.8s. And now, although the KSC has a wide range of media – furniture, glass, automata, prints – studio ceramics is the largest element of the Collection. 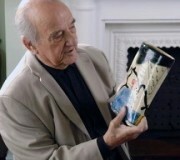 A Life in Clay celebrates the creativity and originality of British studio potters in the 20th century and reflects Ken’s lifelong passion for ceramics. On show will be pieces by Sam Haile, Dan Arbeid, Gillian Lowndes, James Tower and Walter Keeler, as well as many others. The launch of A Life in Clay will take place on Thursday 20 July from 6-8pm and on Saturday 22 July from 11am-4pm, with the upper floors of the KSC being open to the public on both occasions. The exhibition will be open on Wednesdays and Saturdays from 11am – 4pm and admission is free. 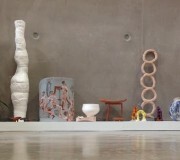 An exhibition of ceramics made by students from Cardiff School of Art and Design will be on show at the Design Study Centre. The Private View is on Monday 12 June from 5.00 – 7.00. Join us to see exciting and fresh new work inspired by the Ken Stradling Collection. The show then continues until Thursday 15 June from 11.00 – 4.00 with a warm welcome and free admission. A mixed media exhibition exploring the various ways in which designers use colour in their work, and the different moods it can create. 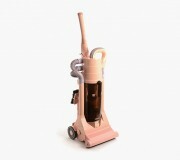 Among the many and varied objects on display you will find this pink Dyson vacuum cleaner from the early 1980s, a wonderful selection of studio glass and the bright and bold scarlet of a Thomas Heatherwick Spun chair. Never tried one out? Now’s your chance. The exhibition launch is on Saturday 4 February from 11am-3pm. The gallery is open every Wednesday 10am – 4pm and the following Saturdays: 4 February 4 March 1 April 6 May from 11am-3pm.